Diamonds Size For Engagement Rings What Is The Right Size? Home » Engagement Rings Cuts » How Big Should My Diamond Engagement Ring Be? How Big Should My Diamond Engagement Ring Be? What is the best diamond size for me? The depth of love is not impacted by the size of your wedding diamond, emotionally as well as technically. While Carat weight is used to form a fundamental pricing of the diamond, the same is not the be all and end all of the diamond pricing either. Being the result of myriads of processes, the carat weight of a diamond is the result of many other micro processes as well. Does the diamond size determine your personality? While the man might worry about the weight of a diamond owing to the cut-throat pricing, the size of a diamond for a woman can be a crucial and unchangeable choice too. Is there a formula to help you determine the right diamond size for you based on your finger size? No. But, the best formula to pick the perfect diamond size for you is using your heart and head while picking a rock. The value of a diamond is determined using many other specific characteristics in addition to the carat weight, like Cut, Clarity, Symmetry and Color fundamentally. It is true that bigger the diamond, its rarity and price shoots up. If you desire to cut the costs, yet get a huge diamond for your wedding ring, try the topic of treated diamonds. Usually, called enhanced diamonds, these diamonds are cheaper due to the imperfections and inclusions in it. Diamond experts fill the inclusions with fillers such as silicone to make it flawless. As these are treated diamonds, one can get off with at least 100% discount on the diamond prices not to mention the giant stones for meager prices! The curiosity to know the diamond carat is innate to most of us diamond lovers. Regardless of whether it’s the queen or Lady Gaga who is seen with a striking bauble, the first question to most of us when seeing a beautiful rock is how heavy it is! Sold in the unit of carat or ct, diamonds carats are divided into 100 points per carat that are referred in decimal or whole points (For example- 0.25 or 25). All diamonds are cut from of rough diamond (big block), which are then cut or polished to fit various sizes. There are no two diamonds with equal characteristics and hence even the same carat weight does not denote that the diamonds are of the identical price tag. If you’re particular about a specific carat weighing diamond, determining a high quality sized diamond needs thorough analysis. The size of the diamond you’re expecting matters. This is because, except for magic sizes and standard sizes, not all size of loose diamonds is readily available. With diamond geezers trying to create maximum magic sizes, undersized diamonds are lower at present. Knowing your aspired carat weight for the diamond will help you determine your budget for diamond shopping efficiently. Nevertheless, many parameters add to the total effect of a diamond. Moreover, if you’re not careful about picking a quality diamond, the hazy flaws might be a big loss to you in the future. Diamond carat weights are popular or standardized owing to the long history of public’s approach and demand of diamonds. Often you must have noticed the drastic (25%- 50%) price hike in diamonds that claim the magic weight unlike the diamonds with rugged weights. These are diamonds that are just a few carat points short of the magic size and hence slightly under the magic size or undersized. The Magic size of a diamond refers to the perfectly cut diamond of a precise carat weight like- 0.50, 1.00, 2.00 and so on. The magic weights of a diamond are ½ ct, ¾ ct, 1 ct, 1.5 ct or 2 ct. Furthermore, choosing a diamond ring with increased diameter can provide a bigger look of the diamond. Carat weight of a diamond is created during the cutting of a diamond. Depending on the superlative skills of a diamond cutter as well as the diamond that is wasted during the process of polishing the diamond in order to attain the precision in size, also adds to its value. It’s a fact that large diamonds with excellent quality are extremely hard to find and hence, rare. As cheaper enhanced diamonds are available in a bigger size if shrinking the diamond price is all that you’re after. The best way to find out if a particular diamond size is for you is by wearing it under different shades of light to see its impact on your hand in real-time. While the size adds a different light to your diamond, it is easy to manipulate any diamond to make it of superior quality, by adjusting other characteristics to make it look bigger. The cutting of a diamond determines the number of rays that pass through it, the resulting reflections as well as the brilliance of a diamond. There are many types of cuts of a diamond that helps to determine if your personality matches with its size. While sensitive personalities favor the heart cut diamond, the round is a classic for all. While a poor cut diamond will display dull effects and hence even make the diamond look different to its original size. By availing a superior cut of diamond for a lower carat weight, you can resolve the size issue parallel to a cost-efficient budget. For example, choose an emerald or marquise shaped diamond with a carat weight of 0.98 to get the equal or more of the size effect of a 1 ct diamond. A clean diamond is priceless and is determined by the rate of inclusions in it. It is a fact that only poor clarity diamonds tend to have visible inclusions and with bigger girdles and higher clarity, even small diamonds look bigger. The right diamond size based on its clarity is determined by the grade of clarity. Having a Good grade of clarity will suffice for bigger diamonds and the money saved on lower quality can be added to buy higher weighing diamonds. There are ten plus fancy shapes in addition to the classic round, for diamonds. The shape of a diamond can help you add more carat weight by appearing to be bigger than it is. Diamonds with a larger girdle and crown can give make the diamond look bigger. By choosing shapes like Oval, Square and Marquise, you can increase the carat weight of your diamond in look or add the saved money for a bigger diamond! In fact, with an Oval 0.92 ct diamond, the size will look akin to a round diamond of carat weight 1. While round diamonds tend to look smaller, fancy shapes with the larger spread are the best cut of diamonds that make the rocks look bigger than their original size. A colorless diamond is priced expensively than its colored counterparts. An amazing way to make your diamond look bigger than its real carat size is by choosing a diamond in your favorite color and adding the saved money towards more carats for the same diamond. While you can smartly keep the whiteness of the rock by adding blue fluorescence to a hued diamond, you can save up to 15% of the total bill by adding a colored diamond to your bill. Another important thing to find out what diamond size fits you the best is by analyzing the working and wearing environment of the diamond user. Depending on the career and, the work that you need to do to be part of, diamonds can be vulnerable. A bigger diamond is not befitting for an executive who travels vehemently and furthermore, in this case, it can even impact the productivity. With a bigger diamond, business environment can get daunting due to the risk of theft as well as the discomfort of carrying a bigger diamond and keep it from crashing into stuff! Moreover, if you’re a chef or a writer, or any professional who uses hands to work, the size of the diamond can matter. Mae sure to choose a diamond that complements your personality at the workspace and also makes no hassle in carrying or wearing the same during your work. 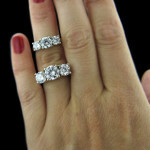 Another important aspect of choosing the right fitting diamond ring for you is with respect to your finger size. If you have a tiny finger, carrying around a 5 carrot ring might be silly. Furthermore, for most slim fingers, bigger rings are attractive, but not practical. This does not mean that bigger diamonds are not for you if you have a slim finger. It means that, you must try the diamond over your finger to see how well it goes with the diamond goes with you. This trial and error method can also help you find the right size of diamond as well as the right qualities for the same. For Long Fingers the shapes such as Round, Cushion, Oval, Heart and Radiant are the best while Short Fingers are best for Pear, Marquise and Asscher. If you’re looking to increase the size of your diamonds without changing its carat weight, the best thing to do is use the optical illusion. Depending on the girdle and thickness of the band of the diamond, creating a bigger surface effect of the diamond is easy as well. Above all, a diamond should complement the Personality of the wearer. While varied cuts and shapes of diamonds can help you select the rightly fitting diamond for you, the size of the rock should match your demeanor too. For example, round diamond refers to a conventional or classy person while hearts and arrows can refer to a neo personality. Provided that the diamond you selected has a thin girdle, the rock will have a bigger spread or surface area, making it look bigger. A thinner girdle is more prone to chipping and it is best to choose a medium girdle for durability of your diamond. While thicker girdle of a diamond adds to the weight besides reducing its size appearance, thinner girdles chip off even while setting. To choose a diamond that appears bigger, make sure the crown size of the diamond is more than average. It’s not all about the size, but the quality as well! The golden tip to buy the best diamond that aligns well with you is by being aware of the qualities that make a good diamond. Just because your favorite character in the movie had a 5 ct diamond does not mean that you should have any five carat diamond. It is true that diamond is a precious stone mostly associated with sentimental values. Nevertheless, being smart about your diamond is brilliant. Provided you’re looking for a 5 carat diamond, simultaneously look for a colored or fluorescent fancy shaped 5 ct rock to manage your total costs. Not only do you build a unique diamond by doing so, you also build a quality diamond with a unique look. The truth is, the size of a diamond matters more personally than most of us imagine. However, the best diamond size that matches you is one that you love and can practically carry as well as afford. Make a smart choice does not cost anything but the time to know the true worth of what you’re buying. If you’re hung on diamond sizes, you needn’t compromise your dreams. To do so, lookout for smart ways to select a colorful and unique dream diamond. Often the characteristics of a diamond can make it look bigger than its carat weight as well as value. Some ingenious ways to make your diamond look bigger than its price is to choose a diamond that has more than average girdle as well as star facet. Engagement is not an everyday routine. It is true that much goes into its selection, but often the size of diamond can be a conflicting detail, even to the point of your sweetheart rejecting your proposed ring! In order to pick the perfect wedding diamond for your beloved, you must know what the wearer wants. Moreover, knowing the smart ways of boosting the carat size of a diamond economically can help you add more to your diamond and get an efficient buy! According to James Allen, the best size of an engagement diamond s 0.9 carats. Renowned as the second best diamond geezer with a reputable history online, James Allen is known for loose diamonds, extraordinary engagement ring styles and countless loose diamond types. Moreover, the James Allen Carat Size Simulator helps you understand how the diamond will look pronged real-time on your finger based on the carat weight of the rock. The various carat weight options available are ¼, 1/3, ½, ¾, 1, ½, 2, 3, 4 and 5. The biggest worth of this simulator for checking engagement rings is the revelation that a 2 carat diamond ring does not mandatorily look twice the size of a one carat diamond. Depending on the various parameters used to set a diamond, the way the diamond looks, also differs. Why 0.9 carat diamond for the wedding? The logical side of a couple is the sole reason that we found that most verified purchases of engagement ring vouched for this carat weight. Being a point lesser than a carat, the 0.9 carat diamond is under-sized. In fact, owing to the reason this it does not claim a magic weight or gross waste of diamond during polishing, the price can be high. While marriage events entail huge expenses, it is best to save on your engagement ring. The universal engagement ring size of 0.9 carats can also be modified to accommodate individual characteristics like a fancy shaped colored or fluorescent diamond. Practically, a 0.9 carat diamond will cost oddly $4000- $5000, while a 1 carat diamond will be priced $7000-$8000. With a whole difference of $2000, not only can you go for a better size of the diamond, you can also opt for a rock with superior qualities, too. The ultimate truth is that, engagement ring being a priceless bauble; its worth is way more than the appraised carat weight. In fact, the sentimental value that it holds is the only factor you need to worry when buying a wedding diamond. Regardless of the size of the diamond, it will forever symbolize your love as a couple and the priceless beauty of it. From the discussion above, it is easy to understand that carat weight is not the sole determinant of good diamonds. Depending on your choice of diamond, the effect of surface area can be increased or decreased to suit your diamond size using the diamond’s characteristics. Remember that poor quality ruins the entire look of your diamond and it’s better to get a smaller ring, if budget is making you choke on a cheaper diamond. Furthermore, it is helpful to seek the expert advice of a GG in order to determine the right diamond for your engagement. While some people prefer vintage loose diamonds that are big, there are many who favor the petite and rare rocks too. Your size of diamond should be analyzed with respect to the setting and style you choose for it as well. Additionally, extending the trial and error method with real time experiment to ensure that wearing the ring is comfortable to you is a smart way for determining the right size of diamond for you! Above all, the best way to know the best size for a diamond for your sweetheart is asking her!